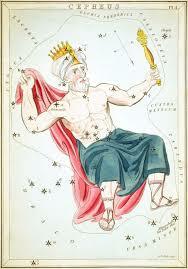 The constellation Cassiopeia is named for the Queen of Aethopia, who was the wife of Cepheus and mother of Andromeda. In Greek mythology Cassiopeia would boast that she was more beautiful than the Nereid nymphs, a boat which of course enraged the Nereids, which then prompted Poseidon to send forth a sea monster. Cassiopeia’s daughter would be placed as a sacrifice to this sea-monster but before being killed, Andromeda was rescued by Perseus. 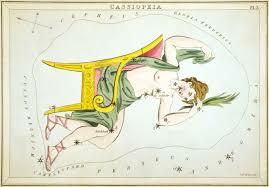 The constellation Cassiopeia appears near to other constellations associated with the Perseus myth, including Cepheus, Andromeda and Perseus, but the constellation Cassiopeia rotates around the North Pole, meaning that as a punishment for her hubris, Cassiopeia must spend time hanging upside down. 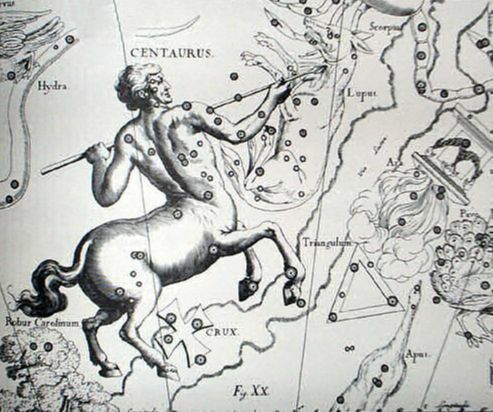 The constellation Centaurus is a representation of a centaur, one of the half-men, half-horse creatures of Greek mythology. There is discord about just which centaur Centaurus is representing, for two names are put forward, Chiron and Pholus. Chiron is the most famous centaur in Greek mythology, an immortal son of Cronus, who would act as tutor to many famous heroes of ancient Greece, including Heracles and Asclepius. Chiron would give up his immortality when he was hit by one of Heracles’ arrows, and was placed thereafter amongst the stars, although Chiron is also associated with the constellation Sagittarius. Pholus was another of the more civilised centaurs. Pholus was friendly towards Heracles and entertained the hero with a meal and wine. Heracles though would end up fighting the other centaurs and Pholus was killed when he was accidentally pricked by an arrow that was dipped in the poisonous blood of the Hydra. 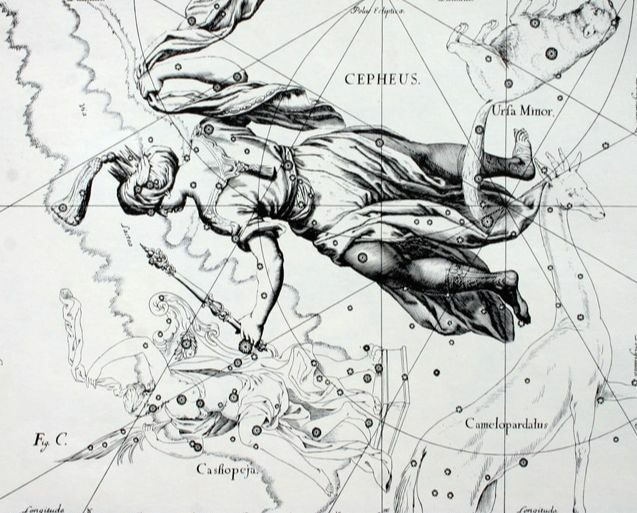 The constellation Cepheus is another constellation that represent part of the Perseus myth, for Cepheus was the king of Aethopia when Perseus came to that land. Cepheus was the husband of Cassiopeia and the father of Andromeda, but disaster would come to Cepheus’ kingdom when his wife rashly proclaimed her own beauty, and a sea monster, Cetus, was sent to ravage the land. Cepheus would be forced to offer up his daughter Andromeda to placate the monster, but then Perseus came to rescue Andromeda and kill the sea monster. The constellations Cepheus, Cassiopeia, Perseus, Andromeda and Cetus are neighbours in the night sky. 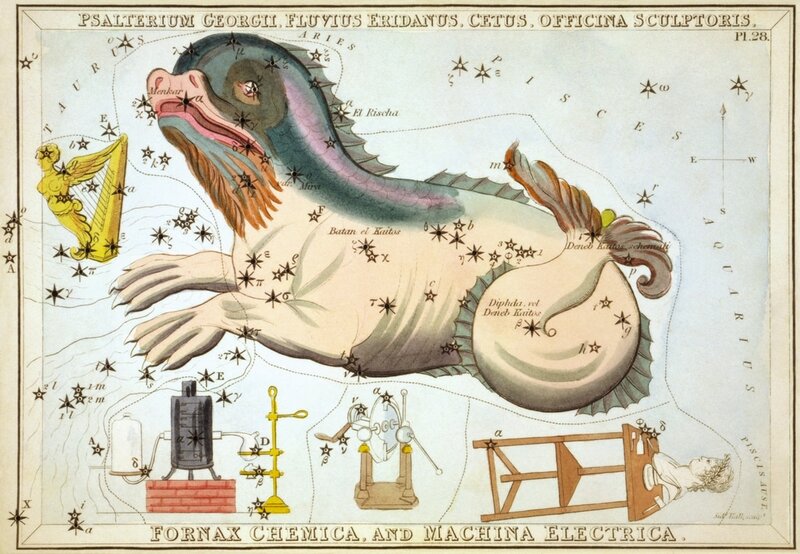 In Greek mythology the name Cetus relates to a sea monster, and there were various sea monsters who appeared in ancient tales, in the case of the constellation Cetus, the sea monster it was said to represent was the Aethiopian Cetus. 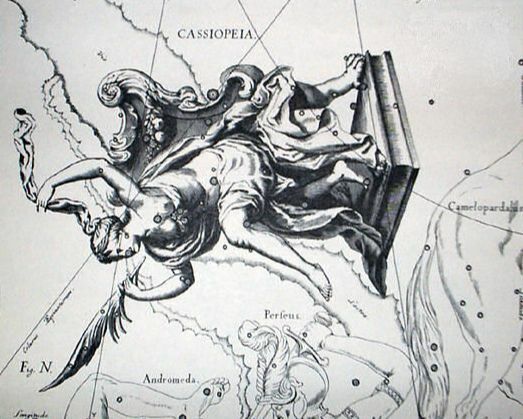 The Aethiopian Cetus was the sea monster sent by Poseidon to ravage Aethiopia because of the boastful Cassiopeia, and it was to this monster that Andromeda was due to be sacrificed. ​Perseus though arrived at this moment in Aethiopia, and using the head of Medusa killed Cetus and rescued Andromeda. 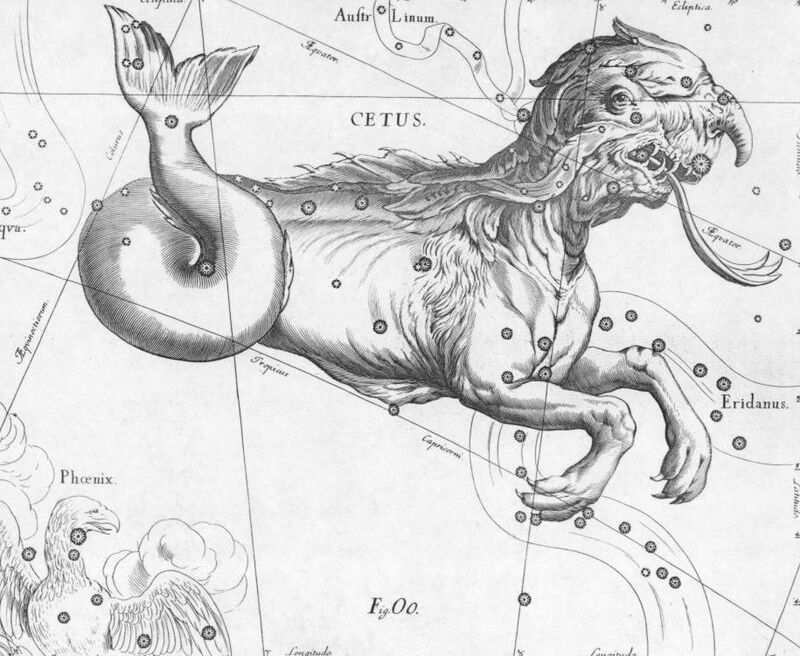 Cetus appears in the part of the sky where many other water constellations are found including Aquarius, the water carrier, and Capricornus, the sea-goat, which gives rise to this locale being known colloquially as “the sea”.